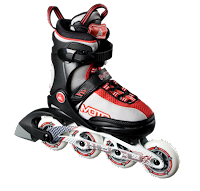 The Moto Extreme Jr comes equipped with an energy transferring aluminum frame, 76mm wheels, and ABEC 5 bearings built for the skilled Junior skater. It is the finest Jr. inline skate that we have ever designed. The Extreme also comes with the supreme comfort of the K2 Softboot and size adjustment capability.